The authoritarian regime of president Alberto Fujimori, who ruled Peru from 1990 to 2000 and has been afterwards convicted of several crimes against humanity and corruption, launched in 1996 a “family planning” program to control the high birth rates. More than 300,000 women and some men were sterilized under this policy. Laura Mancheca, a 21 years old quechua indigenous from Peruvian Piura region, close to Ecuador frontier, was visited up to three times by nurses in her humble home in the following month to the born of her third daughter. Not an usual situation in the congested health system of the Andean country. In the last visit, on 25th august 1997, Laura told them she was having headaches, so she was taken to the hospital, where, they told her, some specialist had arrived and will treat her. Once in the hospital, doctors gave her a saline solution, made her a blood analysis and, after some hours waiting, took her to a surgery room. “They told me they would make me just a lavage to avoid the blood get collected”, she explains in a poor Spanish. They made her sign a document and cover a part of it so she couldn’t see what it said, but that was useless, as she can’t read. She didn’t know then, but her husband had been made sign a consent document when he was getting out drunk a canteen. Even if she was anesthetized and could not move, she was conscious enough to see in a mirror image how they opened her belly. It was the following day, when she was taken back home, when she knew she had been sterilized. Laura is one of the thousands of Peruvian women, mostly indigenous, which were sterilized in the second half of the 1990-decade through deceits, threats or even physical force. The authoritarian regime of president Alberto Fujimori, who ruled Peru from 1990 to 2000 and has been afterwards convicted of several crimes against humanity and corruption, launched in 1996 a “family planning” program to control the high birth rates. “Plenty of women were cheated, telling them that they would get free medicines. Other were threaten with the denial of the birth certificate for their children, with the incarceration of their husbands…”, claims Hilaria Supa, an indigenous Peruvian activist and member of the Andean Parliament (a regional council formed by Peru, Colombia, Ecuador and Bolivia). She has been involved in this case from its beginnings. 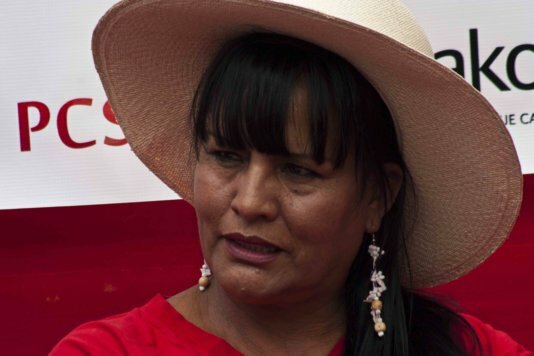 Peruvian authorities were compelled to investigate the demands after several civil society organizations had raised the case of Mamérita Mestanza, an indigenous woman who died due to a forced sterilization carried out in inadequate sanitary context, to the Inter-American Commission on Human Rights (IACHR), an autonomous organ of the Organization of American States. 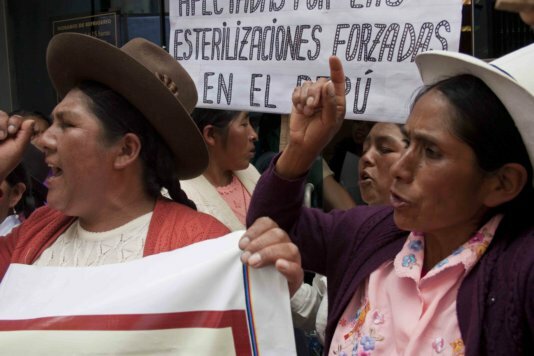 Peru signed a friendly agreement with the Commission committing to compensate Mestanza’s family and to punish the responsible ones for the compulsory sterilization plan. In 2009 the case was filed away, but the IACHR claim force its reopening last year. Fujimori, three of his Health secretaries and 27 public servants more were under investigation. The victims, supported by NGOs, claim that in the “family planning” program execution doctors were pressed with high goals. So, they were compelled to deceive, threat or make fake promised to poor families so they acceded to the sterilization. There have been cases of women tied to the couch to be operated. Victoria Vigo was one of the first in sue because of this policy. In 1996 she was pregnant of her third child and suffer a preterm birth. She had a caesarean delivery, but the child only survived eight hours. Sunken in depression because of the loss, Victoria heard a doctor whispering a colleague she won’t be mother again as she had been sterilized. Once out of the hospital, she get analyzed and confirmed it was true. Since that moment, she has been struggling for justice. “In this 17 years my life has not been a joy”, says Vigo, who remembers that in the first years she and the other victims were attacked by some media bought over by Fujimori’s government. “For the press, we had been paid to sue the government, we were those without voice, the illiterates, like the rats which gave birth lots of offsprings not being able to provide for them”. That’s why she was shaken by the new filed away of the case at the beginning of present year. The new prosecutor who was in charge of the case, after having heard the testimonies of dozens of victims and Fujimori himself, raised charges only against the health team, which sterilized Mestanza and concluded there was no responsibility of the State and the government authotities. The turmoil, in Peru and in the international context, caused by this decision pushed the attorney office to plight itself to consider the appeal against it. Eight months have passed since this commitment and there is not any answer yet. “We only want justice. It’s exhausting and exasperating that we always have to raise our voice to get it and be subject of so many outrages”, Victoria complains. Mariel Távaro, psychologist of Demus, one of the NGOs which have taken the case to courts, points that the effect of the sterilizations is particularly dramatic for indigenous women: “In their worldview, the woman belly is fecund as Mother Earth, as the Pachamama, which it is connected with. Then what has been nullify is the capacity of give life”. In addition to this, some of the victims suffered serious health and social aftereffects of sterilization, like abdominal or backaches, which let them unsuitable for countryside work. Some even die, as Mamérita Mestanza, for surgeries with no proper sanitary requirements. Others were rejected by their husbands and families and even had to left their villages. “After sterilization, my husband changed totally his attitude towards me and left me”, recalls Laura Mancheca. “He told me that he didn’t want anything to do with me because I was useless”. “Sterilizations were very harmful for us”. 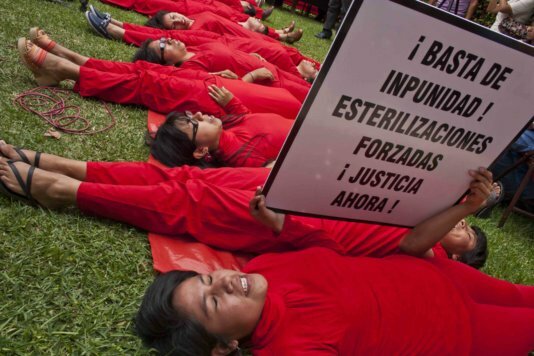 They demand: Stop the impunity of forced sterilization! Justice now!